SCULPTRA® is made from a synthetic polymer called poly-L-lactic acid which is the same substance used by surgeons as dissolvable suture material. Poly-L-lactic acid has been clinically proven to be safe and effective, as well as long-lasting. SCULPTRA® is mostly used for restoring volume and improving facial contours.It is injected in very small amounts using a very fine needle. SCULPTRA® works differently than other injectable fillers in that the poly-L-lactic acid, once injected in the skin, stimulates new collagen to grow, adding volume over time. No skin test is required and there is no downtime. What are the Benefits of Using Sculptra®? SCULPTRA® is proven safe and effective and does not require an allergy skin test. SCULPTRA® results are visible immediately following treatment. SCULPTRA® stimulates your skin to produce collagen. 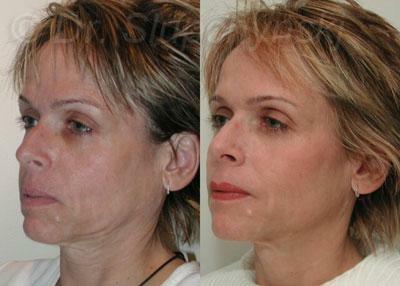 SCULPTRA® is proven effective in eliminating nasolabial folds as well as jowling, and filling out the cheek area. SCULPTRA® is an excellent non surgical option for reducing and eliminating dark hollows under The Eyes, known as orbital hollows or tear troughs. SCULPTRA® treatments last for one year and up to two years. What Areas can Sculptra® Treat and Improve & what is the Procedure? What can I Expect during the Sculptra® Procedure? Is there any Downtime? Oleh Slupchynskyj, MD, FACS uses a small needle to administer SCULPTRA® to the specified facial area. Most patients remark that there is a minimal discomfort comparing the sensation to a bug bite. No sedation for anesthetic is required and you resume normal activities immediately. There is no downtime. How Long can I Expect My Sculptra® Treatment to Last? SCULPTRA® treatment results differ for each person, however, you can expect results to last from 1 year and up to 2 years. SCULPTRA®, on average, requires a series of three to five treatments every four to six weeks. Improvement in contour occurs gradually over two to six months, an advantage for those people wishing to avoid the obvious tell-tale overnight change in appearance of Cosmetic Surgery. Are there any Side Effects to Sculptra® Treatments? Temporary swelling of the injection site is the most common side effect. You may experience tenderness or redness immediately following the procedure. More serious complications include, but are not limited to, bruising, swelling and infection. There are no reported allergic reactions. This patient had Sculptra® injections into various area of her face to fill out hollow, sunken areas. 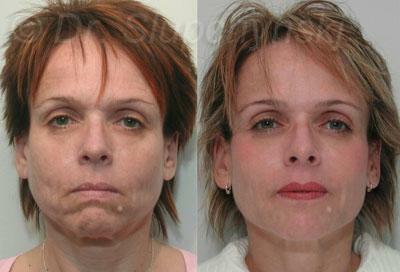 The new added fullness gives her a more youthful appearance. Contact our office today to find out why people choose Dr. Slupchynskyj and the SLUPlift™!